ab52903 detects Smad3 phosphorylated on Serine 423 and Serine 425. 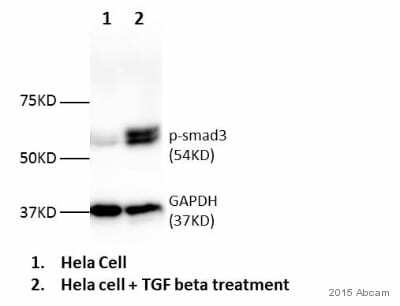 This Smad3 antibody may also detect Smad1, Smad2 and Smad5 phosphorylated at the equivalent sites. A synthetic phospho specific peptide corresponding to residues surrounding Ser423 and Ser425 of human Smad3. WB: HL-60 treated with TGF-ß cell lysates; A549 untreated and treated with 5ng/ml TGF-ß1 for 24 hours whole cell lysates; F9 whole cell lysate. IHC-P: Human stomach and liver carcinoma tissue; Mouse kidney tissue; Environmental enteropathy (EE) duodenal biopsy. ICC/IF: TGFß treated A549 cells; PML+/+ mouse embryonic fibroblasts (MEFs) were transfected with either CTL-siRNAs or NDRG1-siRNAs; Mouse primary embryonic epicardial cells. Our Abpromise guarantee covers the use of ab52903 in the following tested applications. WB 1/2000. Predicted molecular weight: 48 kDa. Avoid using milk, casein, and phopshorylated proteins in general in the blocking buffer and in the antibody diluent. We recommend a solution of 5% BSA (bovine serum albumin). The secondary antibody is rabbit specific IHC polymer detection kit HRP/DAB (ab209101). Immunocytochemistry/ Immunofluorescence - Anti-Smad3 (phospho S423 + S425) antibody [EP823Y] (ab52903)Image from Tang MK et al., PLoS One. 2013;8(3):e59477. Fig 12.; doi: 10.1371/journal.pone.0059477. TGF-β1 signaling is impaired in NDRG1-silenced MEFs. PML+/+ mouse embryonic fibroblasts (MEFs) were transfected with either CTL-siRNAs (A & B) or NDRG1-siRNAs (C & D) and induced with100 ng/ml TGF-β1. Immunofluorescent staining revealed intense nuclear staining for phosphorylated SMAD3 (SMAD3-P, ab52903) in CTL-siRNA treated MEFs (B) while only weak nuclear staining for MEFs treated with NDRG1-siRNA (D). 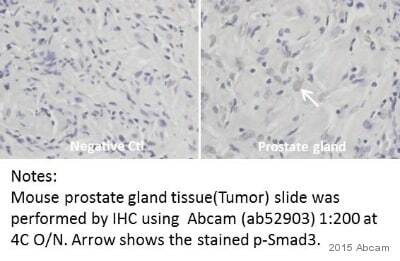 Immunohistochemistry (Formalin/PFA-fixed paraffin-embedded sections) - Anti-Smad3 (phospho S423 + S425) antibody [EP823Y] (ab52903)Image from Syed S et al., PLoS Negl Trop Dis. 2018;12(2):e0006224. Fig 4.; doi: 10.1371/journal.pntd.0006224. Representative IHC photomicrographs from an Environmental enteropathy (EE) duodenal biopsy showing p-SMAD3 staining (ab52903) in only the epithelium (arrows). Purified ab52903 staining Smad3 in Human stomach tissue sections by Immunohistochemistry (Formalin/PFA fixed paraffin embedded sections). Tissue was fixed with paraffin and antigen retrieval was by heat mediation using ab93684 (Tris/EDTA buffer, Ph9.0). Samples were incubated with primary antibody at a 1/200 dilution. A ready to use rabbit specific IHC polymer detection kit HRP/DAP (ab209101). Hematoxylin was used as a counterstain. Nuclear and weakly cytoplasmic staining on human stomach without alkaline phosphatase treatment (image A). No signal can be detected when tissues were treated with alkaline phosphatase (image B). Immunocytochemistry/Immunofluorescence analysis of A549 +/- TGFβ (5ng/ml, 24h) and A549 + TGFβ (5ng/ml, 24h) + Lamda phosphatase (LP) cells. Smad3 (phospho S423 + S425) was labelled with purified ab52903 at a dilution of 1/100 dilution, while Smad3 was labelled with ab207447 at a dilution of 1/500 dilution. Cells were fixed with 4% paraformaldehyde and permeabilized with 0.1% triton X-100. ab150077 (goat anti-rabbit IgG Alexa Fluor® 488) (1/1000) was used as the secondary antibody. The cells were co-stained with ab195889 (Anti-alpha Tubulin antibody [DM1A] - Microtubule Marker (Alexa Fluor® 594)) 1/200. Nuclei counterstained with DAPI (blue). Control: PBS instead of the primary antibody. Purified ab52903 staining Smad3 in Mouse kidney tissue sections by Immunohistochemistry (Formalin/PFA fixed paraffin embedded sections). Tissue was fixed with paraffin and antigen retrieval was by heat mediation using ab93684 (Tris/EDTA buffer, pH 9.0). Samples were incubated with primary antibody at a 1/200 dilution. A ready to use rabbit specific IHC polymer detection kit HRP/DAP (ab209101). Hematoxylin was used as a counterstain. Nuclear and weakly cytoplasmic staining on mouse kidney without alkaline phosphatase treatment (image A). No signal can be detected when tissues were treated with alkaline phosphatase (image B). Lane 2 : F9 (Mouse embryonic testicular cancer epithelial cell) whole cell lysates. Then the membrane was incubated with phosphatase. Immunohistochemical analysis of Smad3 in paraffin embedded human liver carcinoma tissue using ab52903 at 1/100 dilution. ab52903 staining Smad3 in mouse primary embryonic epicardial cells by ICC/IF (Immunocytochemistry/immunofluorescence). Cells were fixed with 4% formaldehyde, permeabilized with 0.5% Triton X-100 and blocked with PBS + 1% BSA + 10% goat serum + 0.1% Triton X-100 for 1 hour at 20°C. Samples were incubated with primary antibody (1/100 in PBS + 1% BSA + 10% goat serum + 0.1% Triton X-100) for 16 hours at 4°C. An Alexa Fluor®488-conjugated goat anti-rabbit IgG polyclonal (1/200) was used as the secondary antibody. Lane 2 : (B) HL-60 cell lysates at 10µg treated with TGF. 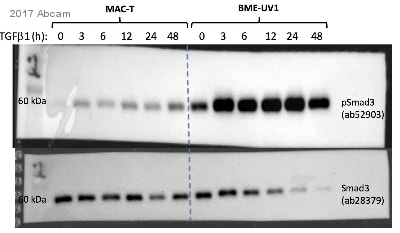 Dot blot analysis of Smad 3 (phospho S423 + S425) phospho peptide (Lane 1), Smad 3 (phospho S423) phospho peptide (Lane 2), Smad 3 (phospho S425) phospho peptide (Lane 3) and Smad 3 non-phospho peptide (Lane 4) labelling Smad 3 (phospho S423 + S425) with ab52903 at a dilution of 1/1000. A Goat Anti-Rabbit IgG, (H+L), Peroxidase conjugated (ab97051) was used as the secondary antibody at a dilution of 1/20,000. Blocking and dilution buffer: 5% NFDM /TBST. ab52903 staining Smad3 (phospho S423 + S425) in human TII Pneumocyte A549 cells by Immunocytochemistry/ Immunofluorescence. Cells were fixed with paraformaldehyde and permeabilized with 0.1% Triton x100 before blocking with 3% BSA for 1 hour at RT. Samples were incubated with primary antibody (1/200: in 3% BSA in 1x PBST) for 24 hours at 4°C. A TRITC-conjugated goat polyclonal to rabbit IgG was used as secondary antibody at 1/200 dilution. 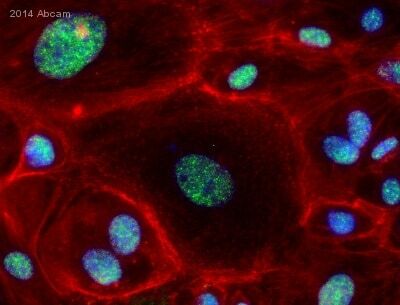 Do you have a specific protocol for staining tissue for antibody ab52903 or for phosphorylations in general. The protocol used with the anti-Smad3 (phospho S423 + S425) antibody [EP823Y] (ab52903) to stain formalin fixed, paraffin embedded tissue sections is as attached to this email. We have not used any specific protocol with phospho specific antibodies. One thing to avoid is using milk in blocking or any of the antibody diluents as milk contains phosho proteins whichcan lead to non-specific staining. Inquiry: Kindly advise if a blocking peptide for ab52903 is available for the purchase. Thanks in advance for your assistance and reply. Have a wonderful day. We added the blocking peptide for ab52903 to our catalog under the product number ab135224. I hope this information is helpful and wish your customer good luck with their experiments.